Christmas! It's almost here! How do we know? 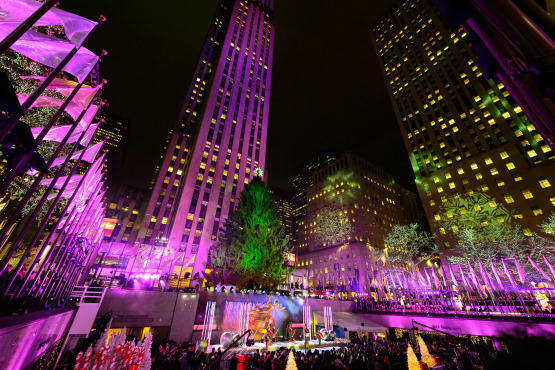 The Rockefeller Center Christmas Tree lighting ceremony happened last night, when 45,000 LEDs were switched on to illuminate the iconic attraction. Of course, the 76-foot-tall evergreen wasn't the only draw; Rockettes danced, and musicians such as Mary J. Blige, the Goo Goo Dolls, Jewel and Mariah Carey (who righteously sang "All I Want for Christmas Is You") performed. Mayor Bloomberg flipped the switch, and the yuletide bash aired on NBC with hosts Matt Lauer, Al Roker and others from the Today show. Yesterday's ceremony was dedicated to James Lovell, a sound and lighting expert who was killed in the tragic Metro-North train accident on Sunday when he was on his way to work on the tree. The twinkling spruce, which is topped with a 9.5-foot-wide Swarovski star, will be on display until January 7. For a sneak peek sans the crowds, check out photos of yesterday's ceremony and a video of the tree at the moment its lights were switched on.